Stephen F. Austin State University's Arthur Temple College of Forestry and Agriculture will host NacogdoTREES, a free community-wide contest encouraging residents to submit their favorite trees located on the SFA campus, their own private property or on property managed by Nacogdoches Parks and Recreation. 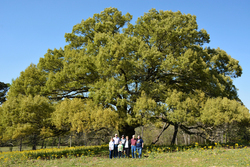 Pictured is Nacogdoches resident Sue Ellen Law and her family with their Southern red oak, which won the 2018 categories of largest crown spread and largest circumference. The tree's circumference measured 19.5 feet, while its average crown spread measured 123.9 feet. NACOGDOCHES, Texas - Stephen F. Austin State University's Arthur Temple College of Forestry and Agriculture will host NacogdoTREES, a free community-wide contest celebrating the natural beauty of Nacogdoches, from Oct. 1 through Nov. 16. "The goal of NacogdoTREES is to highlight the importance of urban and community trees, raise awareness of their ecological benefits, introduce the community to the field of forestry and encourage citizens to spend time outdoors," said Sarah Fuller, outreach coordinator for SFA's Arthur Temple College of Forestry and Agriculture. The competition includes categories for largest tree circumference, largest crown, tallest tree, best shade tree and best overall tree. Prizes will be awarded for each category. Faculty members developed videos to teach some basic forestry measurements, including tree height and crown spread. The videos are available on the competition's web page to guide participants through the process. "Keep in mind that it's not just all about numbers and measurements," said Dr. Shelby Laird, assistant professor of forestry at SFA. "The best overall tree may be the tree with the best story, the most fans or simply just the most beautiful. We really hope NacogdoTREES encourages people to visit some of our amazing city parks and the SFA campus." The competition also will serve as a learning opportunity for beginning forestry students at SFA. Students enrolled in Laird's careers and competencies in forestry course will execute the required technical measurements to determine the winners in each category. Laird said she also hopes the competition will provide insight into what specifically endears individuals to certain trees and provide baseline data for future research. Trees eligible for submission must be located on the SFA campus, properties managed by Nacogdoches Parks and Recreation or on the entrant's personal property. For competition guidelines, an entry form, a list of prizes, area maps and resources, visit forestry.sfasu.edu/nacogdotrees/.